Psilocybe cubensis, also know as the Psilocybin mushroom is a fungus. We’ve known about this fungus since ancient times. Nine thousand years ago, Psilocybe cubensis was mostly eaten raw or dry. Interestingly, they would even add it to other foods for flavor. 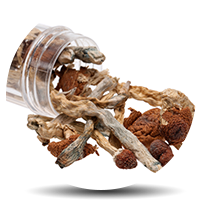 Today, people use shrooms mainly due to their stimulant properties. Mostly, they get eaten if one wants “to go on a magic trip,” and maybe escape reality. The word “magic” in “magic shrooms” is for describing the many happy feelings one may have during a “trip.” Moreover, shrooms can also cause delusions, altered thinking, and synesthesia. Also, some other effects may be spiritual awakening and altered sense of time. Yet, many have said it’s the least harmful of addictive substances available today. Thus, may be why it gained fame among many substance abusers in recent years. Scientific research shows that psychedelic drugs can not cause addiction in users. People can use this drug medically or for “fun.” Yet, they don’t have to worry about the possibility of forming an addiction. Mild to severe addiction can happen. Mainly in users who use shrooms for therapeutic reasons for a prolonged period. People who use shrooms for fun may keep increasing their dose. They may do this to achieve the same power of a “good trip.” Which sadly, may lead to further physical and mental addiction to this substance. Mushrooms do not fall into the group of physically addictive substances. Well, at least not yet, and they have no link with causing any brain damage. However, developing tolerance to shrooms can happen easily in a very short amount of time. Though, it does reduce in just a few days. shrooms can not cause physical addiction. But, there is a chance of psychological addiction. In most cases, the reason why users continue a higher shroom intake is due to the “spiritual journey.” This “journey” can become highly addictive. In other words, users become addicted to the experience, but not the substance itself. As a result, a psychological variant of addiction can occur. Certain people eat mushrooms simply because they seek the spiritual adventure. Which, all in all, these shrooms provide. Psilocybin— is the most active chemical found in shrooms. Luckily, it does not trigger withdrawal symptoms. Therefore, is why drug replacement therapy is not required during psilocybin detox. However, most of the habit forming chemicals are stored in fatty tissues. So, slight withdrawal symptoms may occur due to the sudden stoppage of the substance. Avoiding the signs of severe withdrawal symptoms and side effects is hard. Experts often recommend a slow decrease of the mushroom dosage. As such, removing the abuser gently off the substance. Furthermore, there are times when they might have to conduct sensory stimulation. They do this to reduce HPPD (Hallucinogen persisting perception disorder) symptoms. It’s done to prevent or control seizures and agitation. Finally, usage of benzodiazepines may also have to be used during mushrooms detox. Withdrawal symptoms from shrooms are virtually non-existent. The following symptoms may occur in certain cases. Receiving detox treatment is always a better option than undergoing detox alone. Withdrawal of mushroom abuse may be non-existent. A shrooms abuser who wants to quit should enter a reliable detox center. Where, he/she can be supervised by medical experts, who can offer proper treatment. I just hope that the magical mushroom won’t end up like marijuana. With all the possibilities it can open all doors for treatment of illnesses.